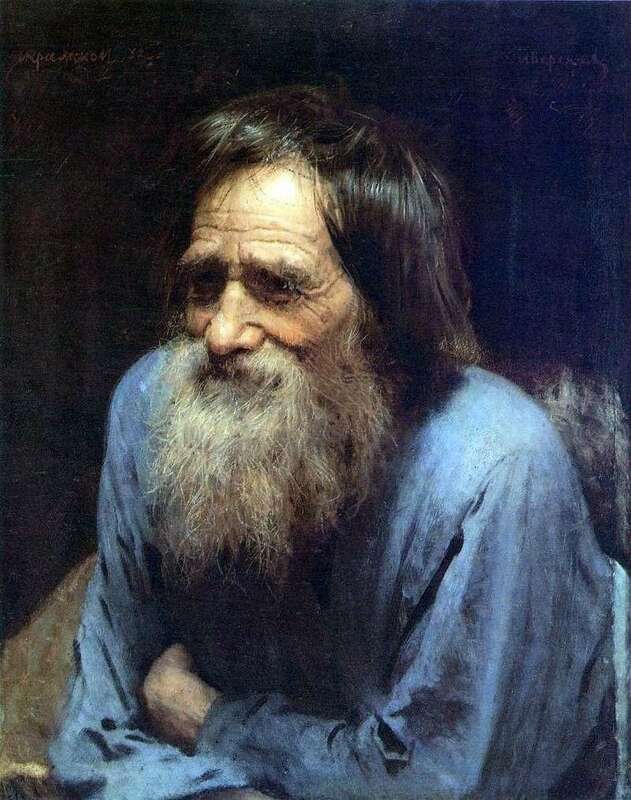 Kramskoy portrayed the peasant in his portrait “Mina Moiseyev”. An elderly grandfather looks at us from the canvas. The gray beard says that he is not young and has lived a great life. There is no smirk in his eyes, I see fatigue in his eyes. Wrinkles cover his whole face. Despite the fact that the old man does not look attractive, I think he suggests telling some interesting story from life. Looking at the picture you want to sit comfortably and listen to the stories of the peasant until midnight. One gets the impression that there is not enough for the portrait of the elder’s wife, as if she is standing behind him and holding a tray with milk and a crust of bread. This old man reminded me of my grandfather, who liked to sit in such a position and tell tales, and jokes. With him, it was not scary to stay overnight in the hayloft, in order to look at the stars. The peasant pictured in the picture, I think, is not afraid of death, in his eyes one can read the fatigue of a lived life. He is not afraid of work. He has the power to plow a garden or to take it away from the cattle. He is wise and can give good advice, teach the mind-reason. I also think for some reason that he is fair. People who are not afraid of work, require from themselves full implementation of it. They are very responsible, because the quality of his work depends on whether he will have dinner. The portrait is executed in calm tones, and even a black background does not cloud it. Tattered and worn out shirt, faded, and from bright blue turned into a dull blue, once again proves that this person is not rich, but constant in his decisions and deeds. Looking at a portrait you can fantasize endlessly, introducing the family and grandchildren of a peasant. What could be interesting are their evenings in the circle of a large family. This picture made me plunge into my childhood and feel all the delights of village life. There, from where you do not want to return. Description and meaning of the painting Mina Moiseev by Ivan Kramskoy.